Last post, I introduced you to California Pidgin Spanish of the gold-rush times, 1858…now, here is más. This time without Chinook Jargon mixed in. First I want to report that the earliest find I’ve made so far of that word “mahala” meaning “Native woman”, from Spanish mujer, is in the place name Mahala Flat, Amador County, CA. It’s in an 1856 newspaper. “Chemuck” = “grub”, that is frontier English for “food”. 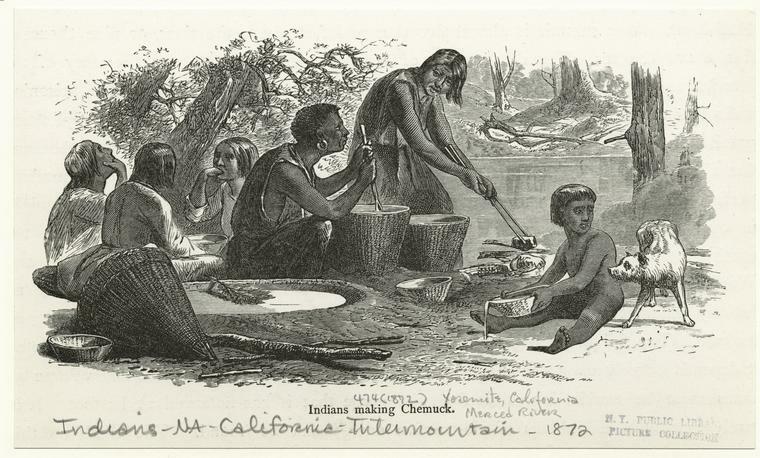 From the local Tuolumne Me-Wuk dialect of the Central Sierra Miwok language? (I don’t find a similar word in the CSM or NSM dictionaries.) Or from Yokuts, because some of the tribe’s people are said to be of that heritage? (I find nothing similar in a N Yokuts dictionary either.) But maybe this is a pan-tribal and therefore perhaps a pidgin word; it’s connected with other tribes such as Pomo, and I’ve seen Cecil Brown speculate that Chumash was a lingua franca … I’ll do a separate post about “chemuck”, it’s worth the while. 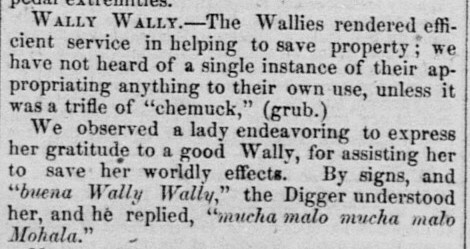 “Buena Wally Wally” = “Good Tuolumne” in pidgin Spanish. Pidgin-looking because of lack of grammatical gender agreement, a feminine adjective applied to a man. “Digger” is frontier Californian for “Native person”. Racist. “Mucha malo mucha malo Mohala” = “Very bad, very bad woman”. Pidgin Spanish. Gender mismatch again, and maybe partly on purpose by the editor. This whole shebang looks par for the course — pointlessly insulting portrayals of Native people and their attitudes, even if and especially when they are showing kindness and patience toward Whites. That’s my opinion as a person with a heart. My professional evaluation is that here again we have really fascinating data on a contact language of the frontier West, California Pidgin Spanish. And it’s one that hasn’t been researched very much, so I’m continuing my investigation as part of my overall program of work. An article should result.